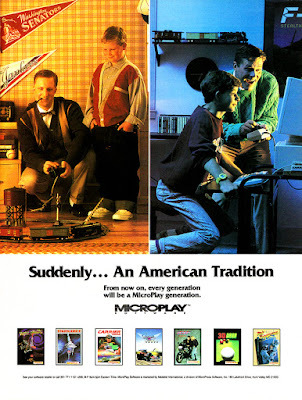 MicroPlay software was a publishing and distribution label of MicroProse Software that, based on the games it was involved in, existed between 1989 and 1992. MicroProse merged with Spectrum Holobyte in 1993 so it makes sense that MicroPlay and other MicroProse extensions might have been dissolved at that time. Next week I'll post about MicroProse but since I go in alphabetical order MicroPlay appears first despite not being as significant. Medalist International appears in many of the ads as well and that was a marketing division of MicroProse that I posted ads for a month ago. The ad below is trying to look old fashioned in the left panel but it features a modern Yankees pennant. I'm sure the advertising team could have found one older than the '90s which is actually the time period of the right panel.